Ditching cable is the trendy thing to do these days. 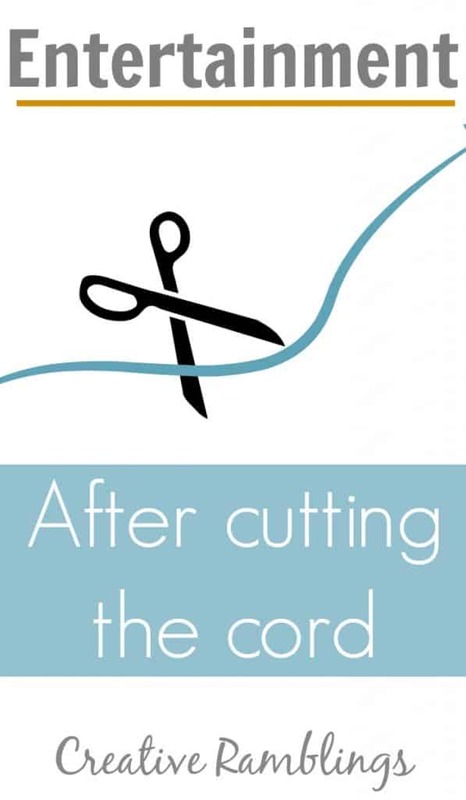 There are “cord cutters”, then there are the millennial “cord nevers” Not only does it save you money but, in our case, it has resulted in us watching a lot less TV. We started streaming our entertainment almost 4 years ago and have never looked back. The options for streaming are numerous and, if you are not careful, you can end up spending quite a bit on something that is supposed to save you money. Here are some of those Entertainment Options After You Cut the Cord, and how to choose wisely so you can actually save money. Want to know a secret? I am a huge proponent of cutting the cord but……we actually still have cable! I know blasphemous right? I have tried to cancel every year, but when I call the cable company, who also provides our internet service, they offer me a discount on my internet if I keep basic cable. Essentially I have gotten free basic cable for 4 years. I get about 2 extra channels than you can get with an antenna and I rarely watch them. I still consider myself a cord cutter and when I call this year (after my promo is up) I will try to cancel again. The year they stop offering a discount is the year I cut it for good. Once you cut the cord it’s nice to have the option to watch TV and movies at home. One of the most popular ways to do this is to stream your entertainment. This means using a variety of devices and services with your internet connection to watch on your TV or computer. Be careful, these services add up. The idea is to save money by cutting the cord. You can end up paying just as much in streaming services as you once did on cable. The links below are affilate links, you can view my full disclosure policy here. Roku Streaming Media Player This little box streams entertainment to our TV. It comes with a variety of channels built in and supports other services like Netflix, Hulu and so on. Google Chromecast Streaming Media Player This is another way to stream TV. I received it as a gift last year and use it almost exclusively to stream my favorite shows that I cannot get on Hulu or Netflix. The Chromecast does support apps but my favorite part is the ability to “cast” any online video from my computer or phone to my TV. There are other similar devices such as Apple TV, Amazon Fire TV Stick , and Xbox. To watch shows we use Netflix and Amazon Prime almost exclusively. Netflix is great for movies and has some good quality shows. Amazon Prime has quite a few good series from HBO and other big networks. I am an avid Amazon shopper so I use the free shipping option that comes with Prime quite a bit too. For Grown-Ups: I don’t mind waiting for a series to come out on Netflix or Amazon to watch it. My husband and I watch one episode of something almost every week night and right now we have a backlog of shows we want to watch. If you like to stay up to date and watch shows as they air, or soon after, consider Hulu or Sling. For Kids: Netflix is also the only service my daughter watches. I have a list of favorites and I’m comfortable with her choosing anything from that list to watch. My favorite part of this for her is the absence of commercials and my ability to control when she watches shows. She gets a set amount of episodes each day and we decide when she watches them. I can’t imagine having to time a program into our schedule. One of our other favorite sources for movies and TV series is the library, yes the library. With all the streaming options available this one can get overlooked, but we’ve watched some of our favorite movies and shows this way. Often they have releases sooner than you can stream them for free. Just a few other options out there to turn to for entertainment: Hulu, Redbox, Sling TV, or just your Antenna. This is scratching the surface, there are so many ways to get your favorite shows and movies. One of the easiest ways might be to just head to the website of the channel you want to watch and view programming there from your computer or device. We purchased a Roku player 4 years ago for $79. I received a Chromcast as a gift this past Christmas, it retails for $30. We pay $7.99 each month for Netflix and $8.25 each month for Amazon (paid yearly). All in all we are saving quite a bit of money over a standard or higher cable package. We continually assess our choices and make sure we are using each service and getting our money worth. We chose to cancel Hulu a couple of years ago because I was only using it to watch one show. I could easily watch that show on my computer through the networks website. Cutting the cord, or never having it in the first place, no longer seems like a bold choice but rather the norm and the easy way to access entertainment. How, and what, do you stream? I’d love to hear your take on this. We have cable for the same reason. We got a huge discount on our internet for having it, but the cable box isn’t even hooked up. We watch Netflix, and download or stream current shows. I’ve gotten used to watching shows without commercials, so I’m perfectly happy to wait until the next day to watch them commercial-free. Once the cable company stops offering a discount on internet, we’re getting rid of it, too. I so agree about commercials, I am happy to wait so I can watch uninterrupted. Thanks for stopping by today. Bookmarking this! We plan to ditch satellite TV soon. You have some great ideas. Found you through the FB group 🙂 Thanks! Wonderful thanks Jeanne, glad you stopped by today. We also cut the cord, and my two boys (ages 2 1/2 and 4 1/2) have not missed it at all. When we cut cable we bought Amazon Fire TV which lets us easily access our Amazon prime movies, Hulu and Netflix. We get all the TV we want for $16 a month. That’s a huge savings for us. It’s the best thing we have ever done. That’s awesome Tennille! I would argue that kids probably prefer this on demand viewing over regular TV. Way to save money!